Team members (left to right) Nolan Walker, Brooke Hudson, Adam Pocock and Cougar Garcia took home the top prize of $1,000 and brought the Materials Territorial Trophy to Tempe. Photo provided by Shahriar Anwar. Arizona State University’s Ira A. Fulton Schools of Engineering had seven teams compete against 13 teams from the University of Arizona (UA) Department of Materials Science and Engineering (MSE) in the 13th Annual Materials Bowl on April 25, 2016. 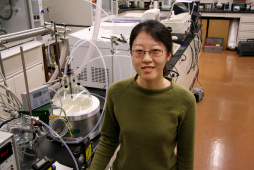 The Materials Bowl is a senior capstone project and poster competition sponsored by the ASM International Phoenix Chapter in which six jury members from the materials community award three top ranked projects. The winning team receives the Materials Territorial Trophy. 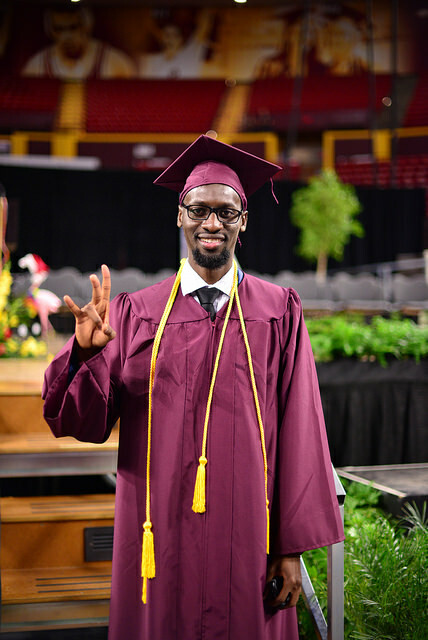 The annual event took place at the Memorial Union on ASU’s Tempe campus. At the event, teams of around three to four students gave presentations to a panel of judges and were critiqued based on the quality of their projects and presentations. 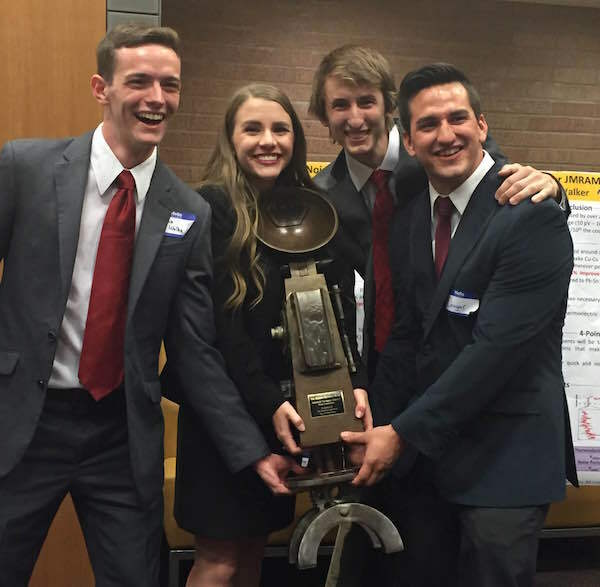 This year, ASU’s team of Cougar Garcia, Brooke Hudson, Adam Pocock and Nolan Walker took home the top prize of $1,000 and brought the Materials Territorial Trophy to ASU at least until next year. Their project was titled “Ultra-Low-Noise Cryogenic Dipping Probe with Dynamic Range for JMRAM Applications.” JMRAM devices are used for superconducting supercomputing to reduce power consumption, but current dipping probes working at ultra-low temperatures of 4K generate noisy results whereas much more expensive systems that cost around $20,000 are less noisy but operate at a limited voltage range. 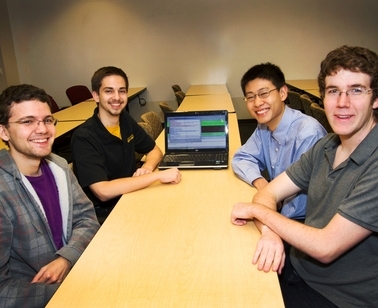 The group designed and made a low-noise dipping probe at a fraction of the cost (around $2,000). Left to right: Elizabeth Quigley, Zheyu Luo, Wey Lee and Anoosha Murella captured third place at the 13th annual Materials Bowl. Photo provided by Shahriar Anwar. The third place team from the Fulton Schools featured Wey Lee, Zheyu Luo, Anoosha Murella and Elizabeth Quiqley. 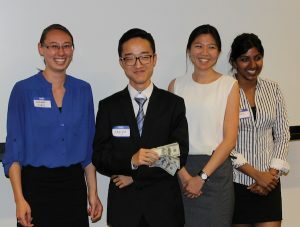 Their project, “Powder Reuse Characterization for Additive Manufacturing,” earned the group a $300 prize. The group worked with Honeywell, Inc., to recycle the use of Inconel powder used for the new technique of additive manufacturing of engine parts, turbine blades and parts of the fuselage. Currently up to 90 percent of the powder is discarded after the fabrication process. 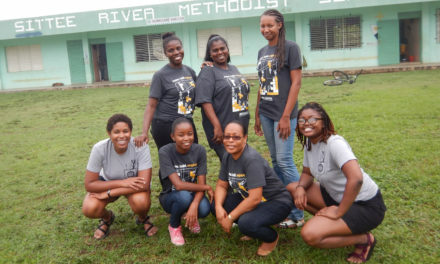 This group designed a water elutriation system to reduce this waste thus reducing the cost of the additive manufacturing process by about 70 percent. Students work very hard throughout the year under the guidance of President’s Professor and Materials Science and Engineering Undergraduate Program Chair James Adams and Materials Science and Engineering Professor Stephen Krause. New to this year, students were able to have one credit of the capstone project course in fall to plan and two credits in spring to bring the project to life.